Radio Frequency Identification (RFID) is a wireless technology which aligns with radio frequency waves to track the tags attached to the objects and people. In healthcare, RFID technology helps in monitoring patient, real time tracking of assets, medication authentication, wait time monitoring, and hand washing, among others. The main reasons or factors driving the growth of RFID technology market in healthcare include price, capability and size. As the price of RFID technology is showing a constant downfall, its demand has been extensively increasing in healthcare (both private as well as government hospitals). RFID market in healthcare is projected to experience a remarkable growth in the next 5 years. The report constitutes of an extensive study of RFID technology in the healthcare market. It includes a thorough analysis of different types of components using RFID technology in healthcare. RFID technology in healthcare market has further been segmented in terms of application, which helps in understanding the need of deploying RFID technology into different applications. It further explains the driving factors, challenges and growth opportunities of RFID technology in the healthcare market. Major players have been identified on the basis of portfolio diversification related to RFID enabled technology, geographical presence and developments related to RFID technology in healthcare. The market report presents a detailed and investigative study of the entire market and provides a comprehensive insight into various forms of developments, trends and key participants. 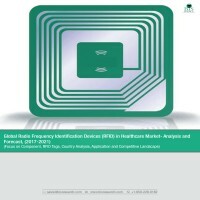 While highlighting the key driving and restraining forces for this dynamic market, the report also provides a comprehensive section on competitive landscape, market share analysis, competitor benchmarking, and their positioning within the global RFID in the healthcare market. A detailed section of company profiling has been incorporated in order to understand the players’ strategic behavior. The RFID technology in healthcare market is further explained and analyzed on the basis of geography, which has been categorized into four regions namely: North America, Europe, Asia-Pacific, and Rest of the World. Moreover, the country analysis has also been done in order to have a clear picture of RFID technology in the healthcare market. The growth rate of various countries has been calculated based on the country’s frequency in adopting RFID technology in the healthcare market, ongoing developments in the regions by the government as well as the private entities. What is the size, in terms of revenue, of RFID in Healthcare market in 2016, and growth rate during the forecast period, 2017-2021? What are different type of components for RFID products in Healthcare by respective manufacturers? What is the revenue generation of RFID in Healthcare being utilized by different end-use applications in 2016 and their growth prospects? How increase in a number of RFID Tags is affecting the growth of RFID in Healthcare market? What is the market size of RFID in Healthcare on the basis of different regions? What are the key trends and opportunities in RFID in Healthcare market, pertaining to countries included in different regions? How attractive is the market for different stakeholders present in the market by analyzing the futuristic scenario of RFID in Healthcare market? What are the major driving forces that tend to increase the demand for RFID technology in Healthcare during the forecast period? What are the major challenges inhibiting the growth of the global RFID in Healthcare market? What is the competitive strength of key players in the RFID in Healthcare market by analyzing through a market share analysis and competitive benchmarking model? Who are the key market players in the market, along with their detailed analysis & profiles? 9.3. Dolphin RFID Pvt. Ltd.
At present, Radio Frequency Identification (RFID) technology in healthcare has a potential to create competitive advantage through automatizing and simplifying the collection of data. It helps various hospitals to track assets accurately and real time monitoring of key indicators which further allows higher visibility in the healthcare operations. However, the benefits of RFID technology in healthcare depends largely on how well it integrates within a hospital’s premises. A decision of deployment of RFID technology is entirely a management decision which solely depends on cost-benefit analysis. Moreover, RFID technology needs to be economically beneficial in order to effectively function for long- term purposes. RFID is an automated device technology which helps in storing as well retrieving data without even scanning the data source. Initially, RFID technology was majorly helpful to improve the supply chain process. However, it further extended its base into manufacturing, retailing, military, traffic management and healthcare among others. Majority of the companies across the globe have experienced exponential growth and possess the capability to further transform business productivity to an advanced level. The factors driving the growth of RFID technology market in healthcare include price, capability and size. As the price of RFID technology is declining, its demand is extensively increasing across all the verticals including healthcare, retail, transportation and defence among others. However, even with such enormous growth, RFID technology in healthcare market is facing a number of challenges which include security and privacy concerns, large amount of initial installation costs and lack of skilled professionals. The global healthcare RFID market is anticipated to reach $4.1 billion by 2021 growing at a CAGR of 21.64% during the forecast period between 2017-2021. The growth in RFID in healthcare market over the period 2017-2021 is expected to be primarily supplemented by factors such as increasing need of patient monitoring due to increasing geriatric population, advancement of product development and increasing support by government for adoption of RFID technology. Furthermore, the future of RFID in healthcare market is expected to be favorable on account of impelling demand due to research and development activities being carried out in companies, expanding internet connectivity along with rising rate of mobile adoption. At present RFID tags and RFID readers leading the components segment in RFID in healthcare. It is expected that RFID tags as well as RFID readers will going to be the forerunner in the forecast period as well. This is generally due to increase in the demand for advanced technology in healthcare across the globe and continuous declining prices of RFID tags. Within application, currently inventory management is showing the largest share in the total revenue of RFID in healthcare. Similar pattern is expected to be maintained in the forecast period as well. The major reason behind this is due to the loss incurred by hospitals in terms of surgical assets misplacement. Moreover, it is expected that in future, number of patients is going to increase who ultimately needs proper medication and care. The market is dominated by North America and Europe however, Asia-Pacific is expected to grow at the highest rate in the forecast period. The dominance of North American region is attributed to the increasing adoption of RFID based products due to features such as low power consumption and high efficiency. Within Asia-Pacific region, the rapid growth is on account of the support from Government in terms of tax exemptions, huge investment in R&D, rising spending on healthcare sector, along with support from private entities for the installation of RFID based technology in healthcare. Furthermore, players in RFID in healthcare market have also invested considerably towards R&D for advancement of this market. Market Players such as IMPINJ and Tagsys RFID Group are expected to invest in millions in RFID technology in order to expand their market share. Other leading players such as Dolphin RFID Pvt. Ltd., and ThingMagic, Inc. have also set up separate divisions for R&D in RFID in healthcare to innovate their product offerings and compete with other leading players in the market. Over the years, most of the well-known players are showing their interest in RFID technology in healthcare market. Players like GAO RFID, IMPINJ, CAEN RFID, STid RFID and Smartrac N.V., among others are investing in RFID technology in healthcare market to a large extent in order to improvise on their products as well as to capture a major market share. Investments into developing economies like India, China and Japan, among others and monitoring of consumables are the major handful of opportunities that RFID technology in healthcare market is lined up with in the coming future. Developed economies including U.S., Germany, France, and U.K., among others have initiated the process of incorporating RFID technology into their healthcare segment. Moreover, with the growing awareness towards health in developing economies (Asia-Pacific), various technological advancements have already been initiated in the healthcare which is further going to increase the demand for RFID technology in the healthcare sector.